Didja spot the omission? Probably not, you’re busy with your lives and everything. It’s my job to keep on top of this, not yours. Turns out I forgot to post photos and a studio report for Flotsam & Jetsam, which has, at this point, been out for exactly 2 months, and was recorded in June. I’ve gone into the dangers of trying to recall details after the event before, but we’ll give this a go for posterity. The first thing to note is that this song is nearly double the length of previous offerings. Practically, it did make things tricky. You can do half as many takes, and there’s twice as much work to be done in editing and mixing. A few years ago strangeday did some work on this song. I’ve been keen to do something with it for a while now, as I’m quite pleased with the feel and lyrics. It transpired that Ally was available for this studio date, and I decided that we could go for Flotsam & Jetsam as he’d written the bassline. Aaron had written some splendid guitar parts for the strangeday version, so I asked him to come and reprise those as well as adding a fair bit to them. The day progressed reasonably well. 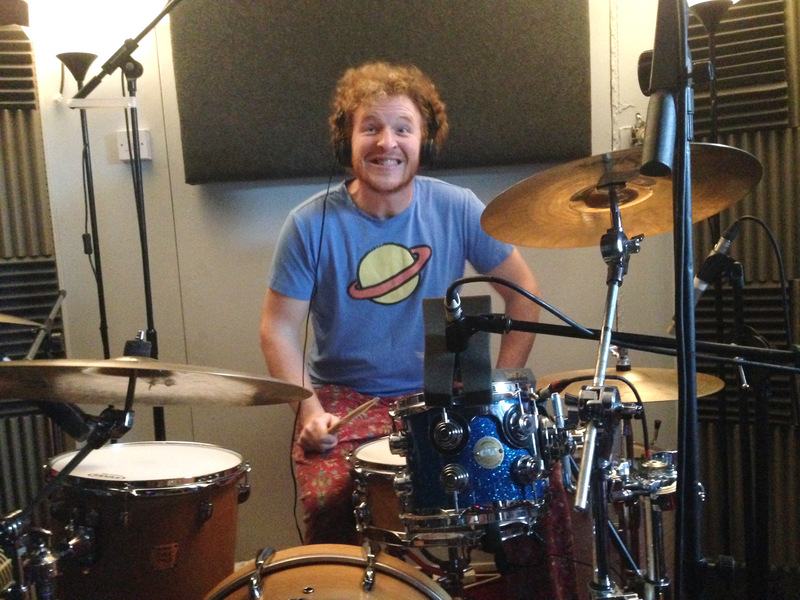 We tracked the drums in the live room, rather than in the studio room, to get a bigger feel. This did mean a slightly more involved set up process. 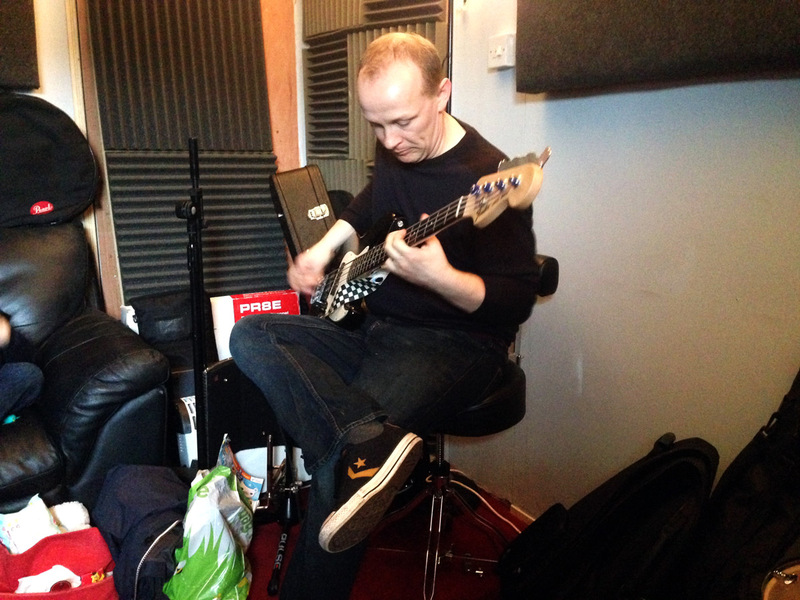 We then got Ally’s bass parts down, followed by acoustic and electric from me. At this point, it was clear that the timeframes were slipping from what we’d hoped. 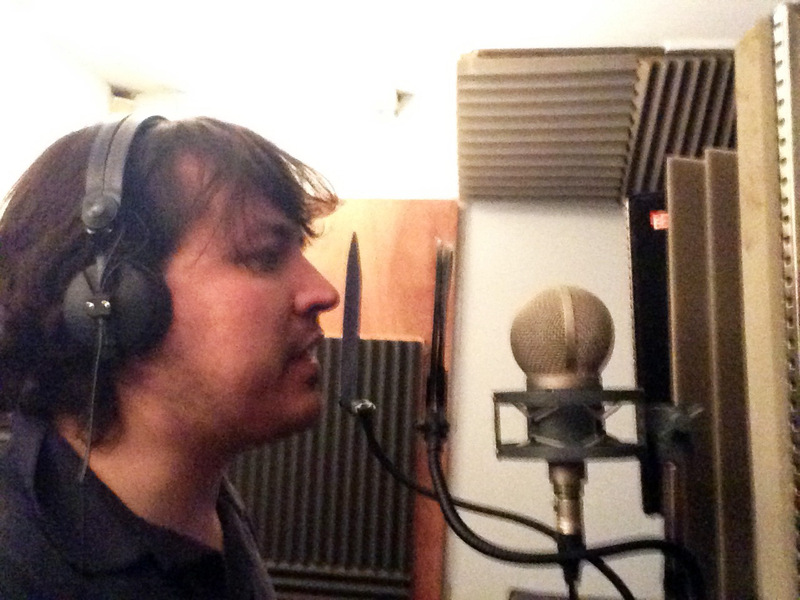 By the time we moved on to vocals it was clear we weren’t going to fit Aaron’s guitar parts. He’d turned up, but was pretty sanguine about coming back another day. We set aside another morning, which also turned out to be village day, and sporadically raining. I wasn’t able to be there the whole time, so I got to hear the final parts subsequently as Paul provided mixes. And I was well pleased! I think that’s about all I have to say about that for now. 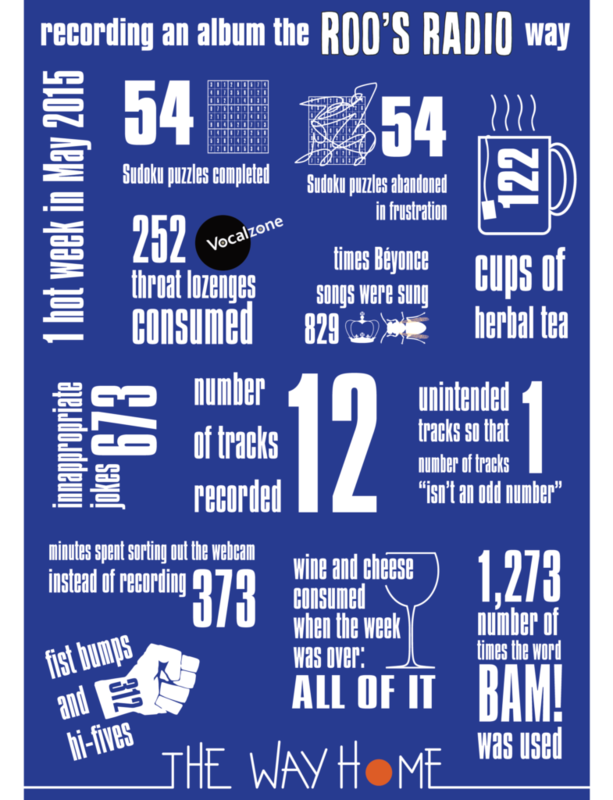 Did I ever tell you about the time we went and recorded the eighth song in the whole of 2016? Sit tight, I’m gonna. You might have noticed over the last few months there’s been more ‘featuring’ type songs going on. Well. Two. Anyway, Paul was asking if I’d ever consider letting someone else sing the whole of a Pedestrian zero song. Then I saw a video of Paul busting out some banging vocals on the internet and I rather thought he might have a point. This song seemed like a great fit. 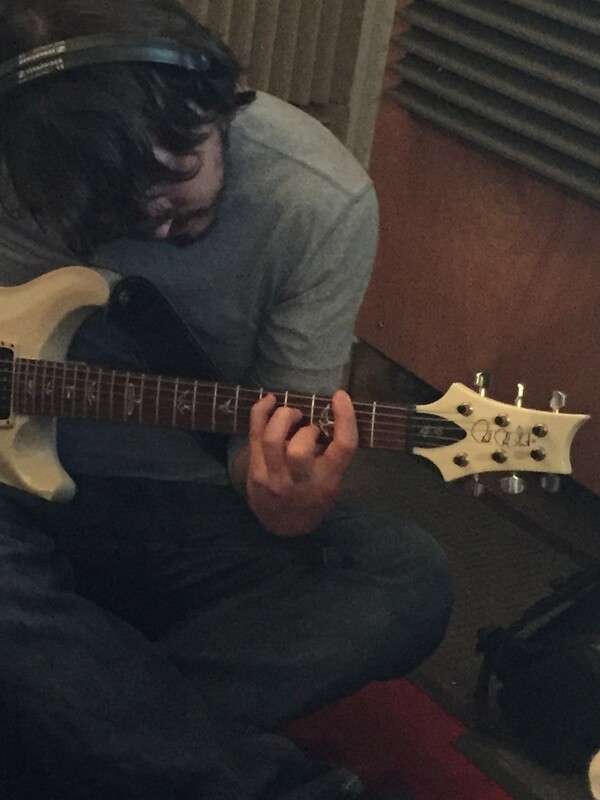 It also seemed like a great time to get in my other strangeday bandmate, AJ, to play some guitar. And oh he did. The final two players in this great drama are Ant Martin, who is fast becoming a pø stalwart, and Cec Harding, returning for the first pedze track since January. In terms of a recording day it panned out much as they do these days. 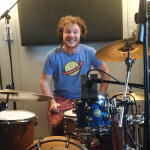 Not obscenely early start; drum set up; drum recording; drum pack down; quick drum comp; Ant turns up with snacks (although El had also bought us bacon rolls from Dolly’s Diner); bass recording; overlap with next musician turning up; debate about whether to sneak in acoustic or have lunch; lunch; vocals; hastily improvised backing vocals. It’s a great time, honestly. All I ended up doing in the end was acoustic guitar and some ooh/ahh backing vocals in the chorus. Which was very nice. Seeing everyone else make their mark on the track was very gratifying. And that’s about that really. Great times. Track should be out soonish. In the meantime enjoy a couple of images and a couple of videos in lieu of the photos I didn’t manage to take. I think the easiest thing is going to be to keep everything in the correct chronological order. Otherwise I’m going to have trouble working out what on earth is going on. Should you be curious though, Flotsam & Jetsam is still very much on the way, and we’ve actually been in to record next month’s release as well. All progressing well. So this post harks back 2 months ish now. I never posted a studio report for dog Tired. So here it is. Personnel for this one were: Paul West – drummist and backing singist, Ant Martin – basser, Jack Lewis – electric guitarer and lead singist, Toby Hawkins – acoustic guitarer and lead singist. 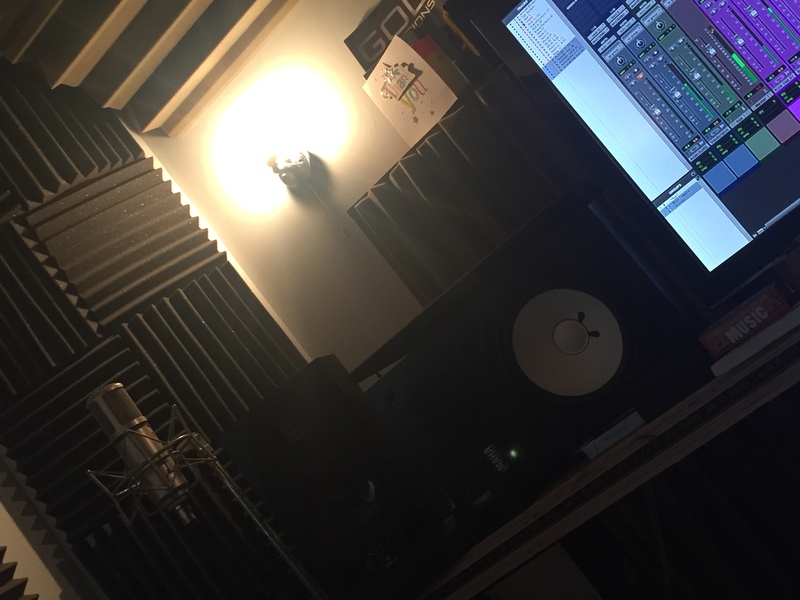 This is the first time I’ve deigned (haha) to share the actual lead vocals on a pØ track. I enjoyed it. I’ll be doing it more often. This was a very reasonable day’s work. 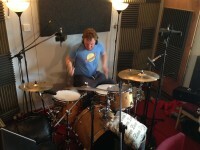 Relying a bit on memory now, but I believe the drums were in already, so we laid down some tight grooves quick smart. Bit spoilt having Paul really. He’s very quickly able to get into the spirit of whatever’s on offer from month to month. Mr Martin was up next, bringing a bag of treats as is his wont. He also brought a big bag of bass. It’s such a delight watching people turn up and bring their own flavour to all of these dumb songs I write. I particularly enjoyed the big slappy bits. Oh yes. 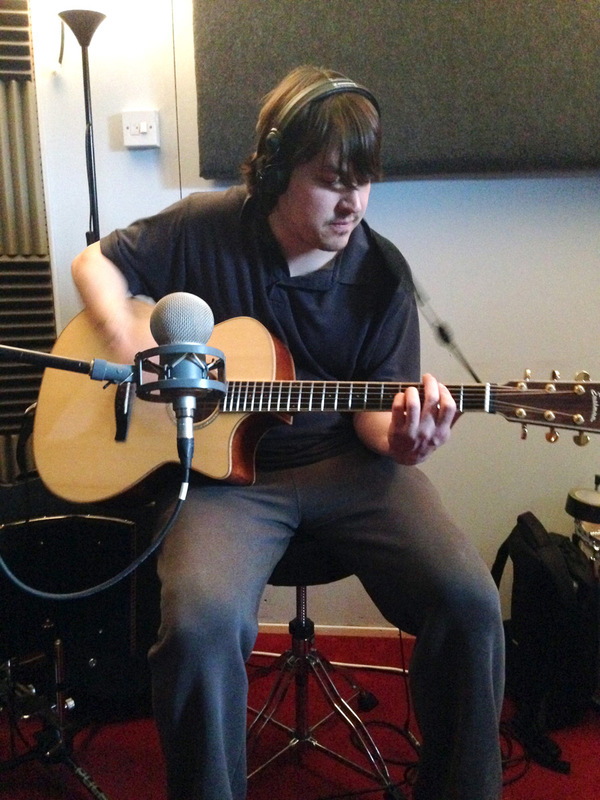 Jack turned up just in time to overlap with Ant, which was nice, and I was next up, recording the acoustic. I can’t remember if I’ve said this before, but I’m feeling pretty confident with recording in general, but especially playing acoustic rhythm guitar. Then it was Jack’s turn to do some electric. I had to run off to do some errand, I forget what, but came back to find Paul and Jack writing/working out the chorus riff. But where Jack really shone was the improvisation stuff. In particular, his improvised solo after the middle eight was a first take wonder. We tried for another take, but it wasn’t worth it as the first was just so good. Then the vocals. I went first, then Jack. There was a little bit of fun working out one of my more obscure timings but other than that everything was very smooth and sounded wonderful. And this time you don’t have to take my word for it. You can listen and judge for yourself! Class. I am also able to report that the non-standard capitalisation of the song title aggravated at least 50% of the musicians involved. So there’s that. This month a day’s recording became a weekend’s recording. Not a solid weekend, mind. But a very enjoyable weekend. In order to accommodate the people I’d asked to contribute to Somewhere in between, I had to shift things around, and we decided we needed to record the drums before Sunday. 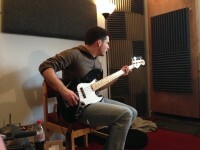 It also worked to throw the bass into this session as well. The original plan was to start early evening on Friday, get a scratch track done, then set up and record the drums, and then record the bass. Traffic on the M25 threw this plan out of the window, so the new plan became to record the scratch track Friday evening, which we duly did, then do drums and bass on Saturday evening. By this point we’d also determined it would make sense to get the lead vocals done after the bass, which we could then comp and edit on Sunday morning ready for Han Goslett to come in and do her vocals. 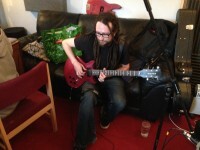 And so it was that I trooped to Awesome Source studios with Paul and Si on Saturday evening. A good time was had by all. Pizza was consumed, sick beats and phat bass were laid down. It was, once again, a wonderful experience to see something I’d written come alive with other people’s creativity. The night was wearing on by the time we got to the vocals. But, minor disaster! My sinuses thought it better to flood with mucus. Singing “Subwhere id betweed” wasn’t really cutting the mustard for Paul and a fresh plan was settled upon. An early start on Sunday was conceived, and, fresh from a very hot shower and hopped up on vocalzone, I recorded an 8am Sunday vocal rather than an 11pm Saturday vocal. Potentially less rock and roll, but definitely less congested. 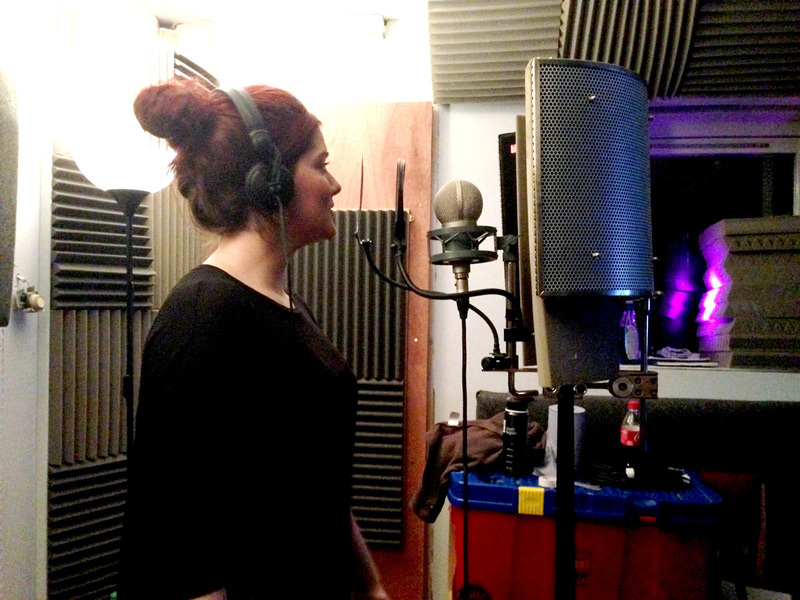 The wonderful Han came by mid morning to record her harmonies and a lead part for the end of the song. 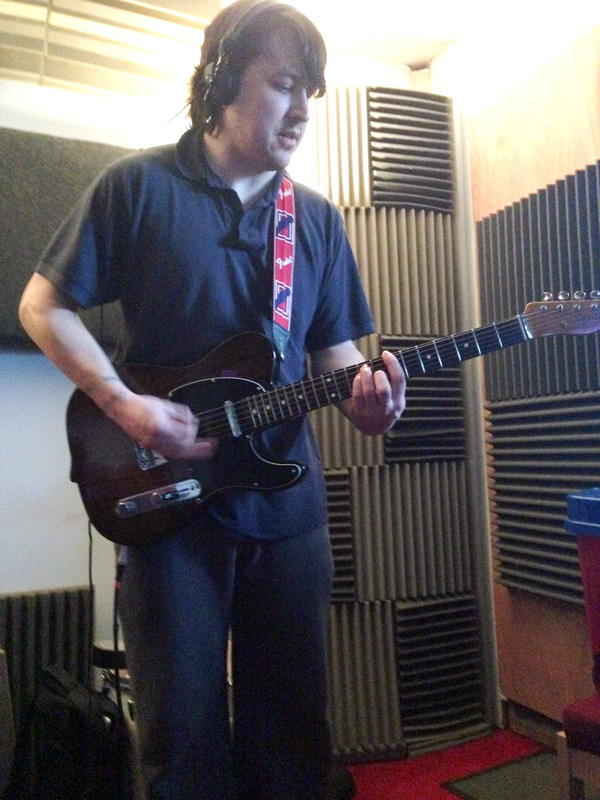 Then we had the multi-talented Tom from Beer Pressure coming to play both a keyboard AND lead guitar part. The benefit to “front-loading” the recording process was that, following a late, relaxed lunch, we only had the acoustic guitar and a guitar/vocal intro to record before calling it a day nice and early. There might be a slightly longer wait for this one as mixing won’t happen ’til next week, but it’s turned out well so far. I won’t take you on a magical mystery tour of the day this time, as it’s not proved to be my favourite format for reporting studio days. Instead, I’ll just throw out thoughts in random fashion. That’s proved popular so far. In as much as I haven’t had any comments posted saying that you don’t like it. One of the amazing things about recording every month is the fantastic improvised bands we end up with. This month’s offering will feature splendmazing (getting bored with my superlatives) contributions from Paul, Ant and Matt O all of whom it was a pleasure hanging out with during the day in addition to adding their musicosity (almost definitely a word) to the song. I can’t remember if I’ve mentioned, but Mind Your PMQs was only written in the last couple of weeks, so it hasn’t had time to embed too much. There was a little more writing on the spot than we’ve previously experienced, which did lead to a slightly longer day and we’ll need an extra evening session this week to get the backing vocals done. It’s an obvious thing to say, but doing this regularly really does increase confidence. 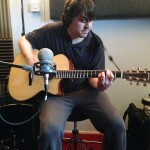 Particularly with vocals and acoustic guitar. I’m still a bit ‘fish out of water’ with the electric guitar (borrowed from Aj of strangeday fame this month) but I do have enormous fun playing the parts. Once we’d worked out what the parts should be. The vocals were pretty good fun to do. 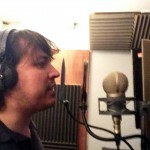 We were really trying to get some passion in there and I attempted my best Dave Grohl impression (I’m rocking the Discount Dave Grohl look at the moment) for the final verse. I’m interested to see how it comes out. Hopefully Paul will be able to work his majicks. I will say this. 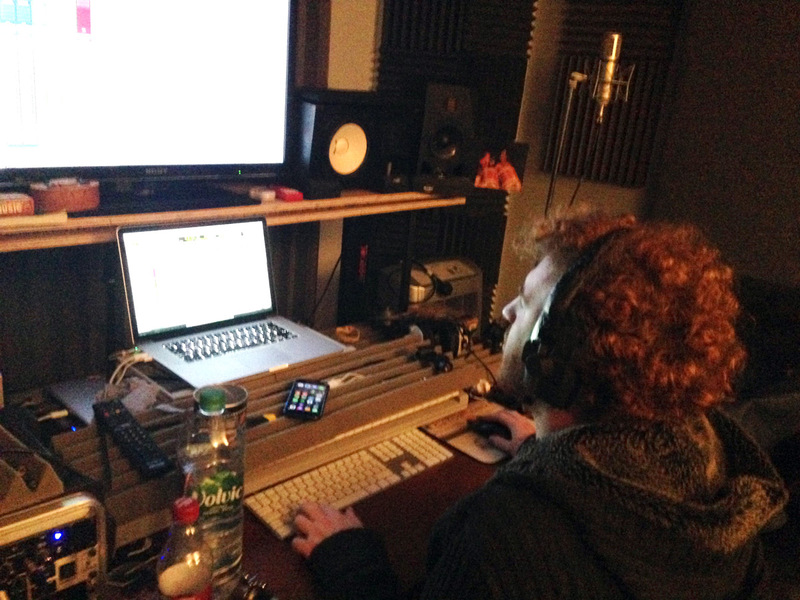 This recording/releasing lark is getting addictive. I’m already trying to work out how I might be able to step up the pace to twice a month. Stay tuned chizzlers. Luckily Paul had all of the drums set up, so we just needed to cable them, line check them and set all the gains and we were off. A combination of a slightly late arrival and a bit of chatting meant that recording started around 10am. But within half an hour the drums were finished and now we’ve moved on to packing down ready for the bass. 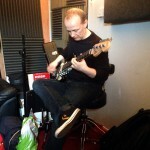 We had a bit of a special treat because Si from 3dBs Down had agreed to come and play bass on the track. He’d written some beautiful parts and they’ve taken the track to a whole new and splendid place. All done and dusted in around an hour. Marvellous. Acoustic all done. Feeling very pleased, and everything’s going pretty well so far. Off to pick up some lunch while Paul sets up for the electric guitar. Managed to borrow a beautiful telecaster for the electric guitar from an open mic regular, Dave. For some reason as a teenager I couldn’t stand telecasters, but I absolutely love them now. Tone is sounding huge and the part is adding loads of energy. All done. That was better than I expected. 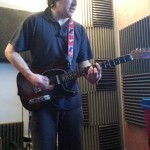 Partly because the tele was such a joy to play. Vocals next. Paul made me warm up using this video. I know it’s good to do but warming up really bores me. But I went for it anyway. Not sure I did the last exercise very well, but hey ho. My vocals are done. That’s all of my parts. 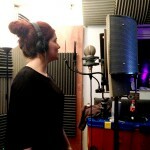 Just backing vocals from Cec and Paul to do now and we’re all done. Time for a beer I think. To the south! All done bar the shouting. And by shouting I mean Paul’s vocals. He’s doin’ em tomorrow. That was a fun day.